Carli Munoz enjoys an amazingly diverse legacy as one of the premiere jazz musicians while also delving into pop, blues, and rock. As the pianist for the Beach Boys in the '70s, Carli recorded and toured for a decade during the Beach Boys resurgence, and penned songs for the seminal solo classic by Dennis Wilson, Pacific Ocean Blue. His jazz artistry evolved with collaborations with Eddie Gomez, Jack DeJohnette, Billy Drummond and others, culminating in Follow Me, that is as musically diverse as Munoz's legacy, notably the standout track 'Wangari Maathai', a blend of world beats, soulful vocals, and jazz improv that fetes the late Nobel Peace Prize Winner and Founder of Kenya's Green Belt environmental movement. 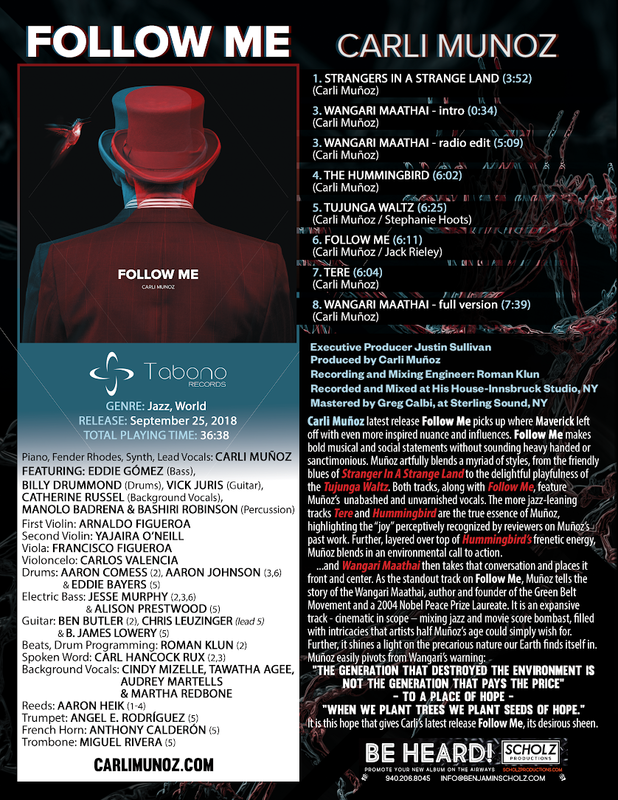 Follow Me is available as a digital download, and as a deluxe CD and vinyl LP package from Tabono Records.